Kathy and Mark Huntebrinker pose next to one of the three new vans Simply Clean uses for deliveries. 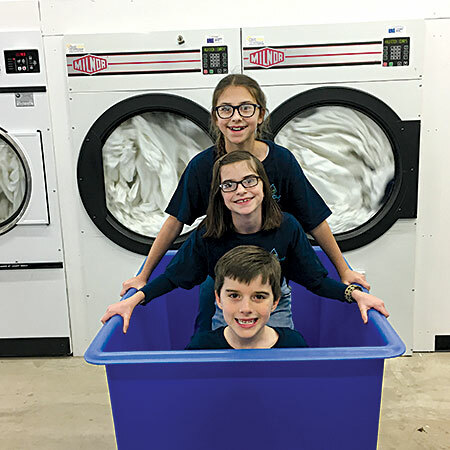 Caitlyn, Norah and Ryan Huntebrinker show off the laundry’s dryers. 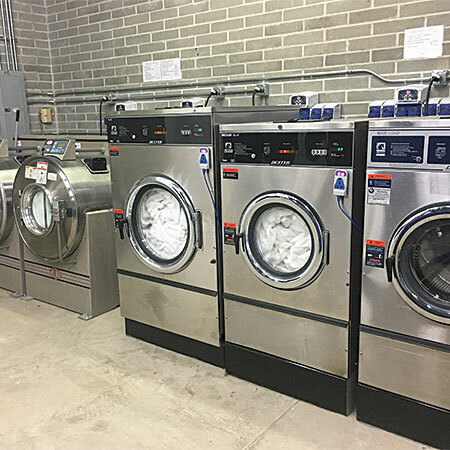 Simply Clean’s new space holds five washer-extractors, compared to the two in its previous rental space. ST. LOUIS — In the late 1970s, Victor Kiam, who was the owner of Remington Products at the time, starred in a national television commercial for the company. That’s how Mark and Kathy Huntebrinker came to own Simply Clean Laundry Service, located here. “We purchased an existing diaper service [Baby Care Diaper Service] back in 2006 after we used the service ourselves and fell in love with it,” explains Mark. For the first five years of their ownership, he says the business operated out of the couple’s house, outsourcing the laundering of diapers to another laundry service. “We had a dedicated room in our house where Kathy and I sorted the diapers, bagged them and then delivered them,” Mark remembers. In the beginning, he says the diaper service was so small that Kathy took care of most things while he continued to work full-time. 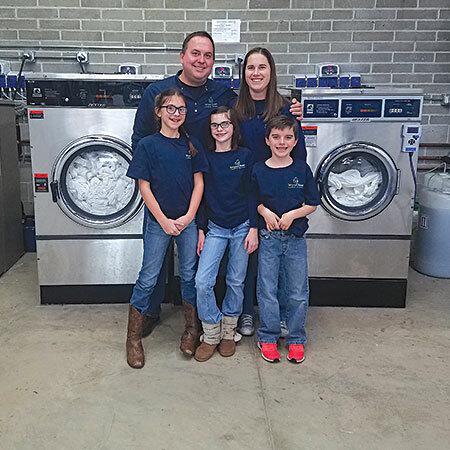 It was in 2011 that the business had grown enough for the couple to rent a 1,500-square-foot building and start washing the diapers themselves. For the first seven years of its existence, the couple exclusively ran the business as a diaper service. Mark says that in 2013, they decided to venture into the commercial laundry industry. Mark says he and Kathy knew they would have to have additional revenue streams to take the business further. Commercial laundering of customer-owned items seemed like a niche they would fit perfectly into, so they made the move into commercial washing, he adds. Early commercial accounts came by word of mouth, according to Mark. However, the couple knew it would take more than person-to-person advertising to succeed. Within two years, the one-time diaper service had expanded to more than 20 commercial accounts. Mark says the business has continued to grow from there. 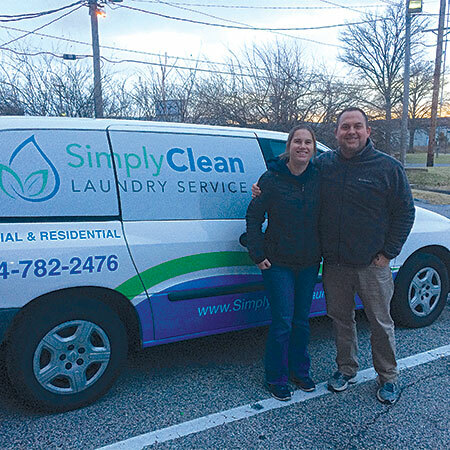 The business kept growing, and in fall 2017, Simply Clean Laundry Service purchased and moved into a 4,200-square-foot building. Besides increasing space and wash capacity, the new building also allows Simply Clean to park its vans inside for loading and unloading of goods. Like many small businesses, Simply Clean Laundry Service faced challenges as it grew. Mark says those challenges are similar to what other growing small businesses experience. As far as hiring good personnel, Mark says he and Kathy have a great team of employees, but that has taken a little time. “We have learned a lot about what makes a great worker and someone to fit into our small-business family,” he adds. Today, the laundry has seven employees and processes more than 300,000 pounds of goods a year. As Mark looks back at the beginning of the business through to its current state, he says there are things he is proud of—and things he wishes he would have done differently. What would he have done differently? Hired help sooner. To make the combination of diaper, residential and commercial markets of the business work, they believe in having good systems to help keep everything organized, Mark says. Each customer has specific wash, dry and folding instructions, so those are documented with a tagging system that stays with the customers’ items from the time the goods are picked up. He adds that Simply Clean’s employees each have certain strengths, which is helpful in keeping the business running smoothly. “For example, we have some that oversee and fold the residential portion of the service and others that focus more on the commercial portion, but all of our employees are cross-trained on our major accounts,” Mark says. While the company has grown in size and service, it doesn’t plan to stop growing.